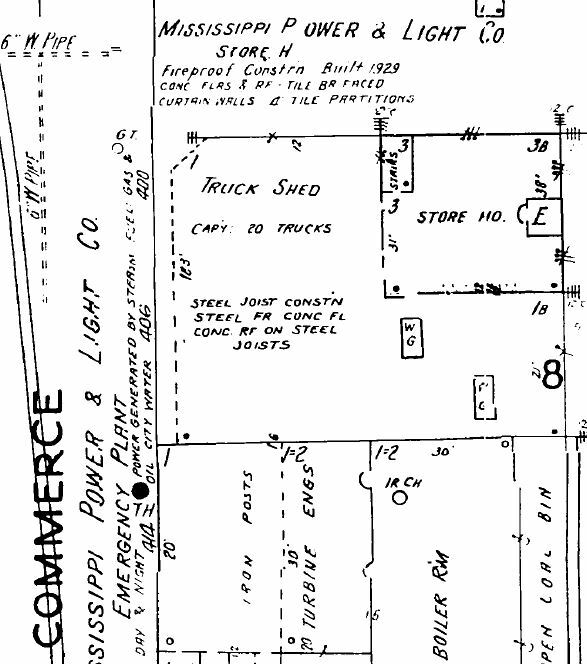 The Sanborn map also notes that the Truck Shed [formerly the Car Barn] is of steel joist construction with wire glass sky lights. The shed is open all along the west elevation to allow for the entry or exit of streetcars and later power company trucks. When I slipped over into Google street view to check out that intersection my first thought was “Shoot! It has been demolished.” But closer looks can sometimes payoff. Below is the intersection, and it looks like a different building at first glance, but in actuality part of the Car Barn has been demolished to allow off street parking, and a brick wall was built to enclose the space. If you look closely along the north wall you can see two window lintels that have had their openings bricked in. Still not 100% convinced that it is indeed the same building? 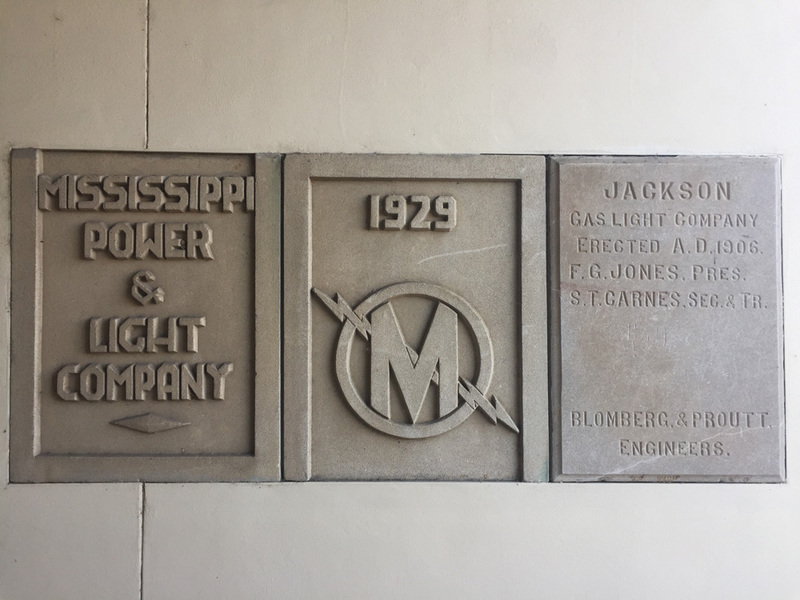 A closer inspection reveals a ‘cornerstone’ in the stairwell with a big ol’ 1929 date and a Mississippi Power and Light Company logo. Anyone in Jackson care to check out that seemingly blank placard and let us know if it contains the name N.W. Overstreet? If you want to see what the building looked like when it still had its opening for street cars on the west elevation, you can see such an image in this book…. What do you think? Is this the same building from the 1929 Manufacturers Record? Good eye on that plaque! I’m going to have to run down there to get a closer look on this fine afternoon. Will report back. No kidding! How cool. Great catch. I completely missed that. Rather than street car tracks those are actually the remains of the Alabama & Vicksburg Railroad line. The plaque is still in place, and in fact is probably two plaques, in three pieces, that have been reset. The two piece 1929 MP&L logo seems to have been originally stacked as a single logo (note borders). The blank looking plaque on the right end states: “Jackson Gas Light Company, Erected A.D. 1906”, with two officers listed plus “Blomberg & Proutt, Engineers”. No mention of Overstreet, but it is obviously an earlier tablet from this building or a closely related one. The car park(an open sided shed) is still there, still used for parking Entergy vehicles, but is now of much later shed construction. 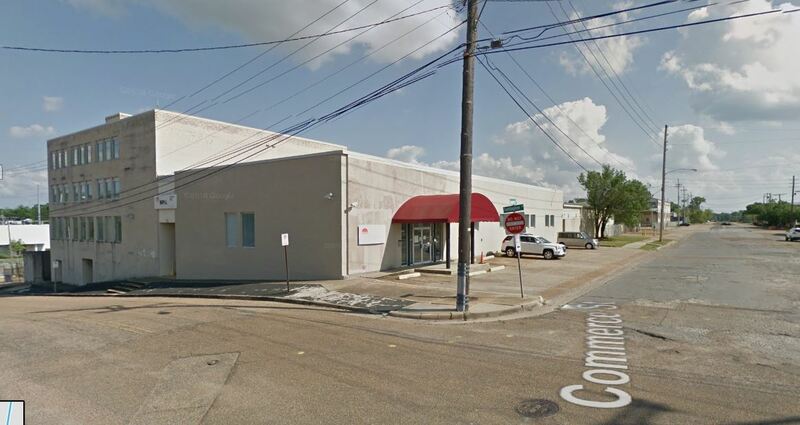 The building still houses Entergy personnel. And there you have it. Thanks! Looks like several of us Jacksonians found ourselves over by this building that I’ve completely overlooked until today, Thomas. I went down there with a friend who took this picture of that rad plaque. 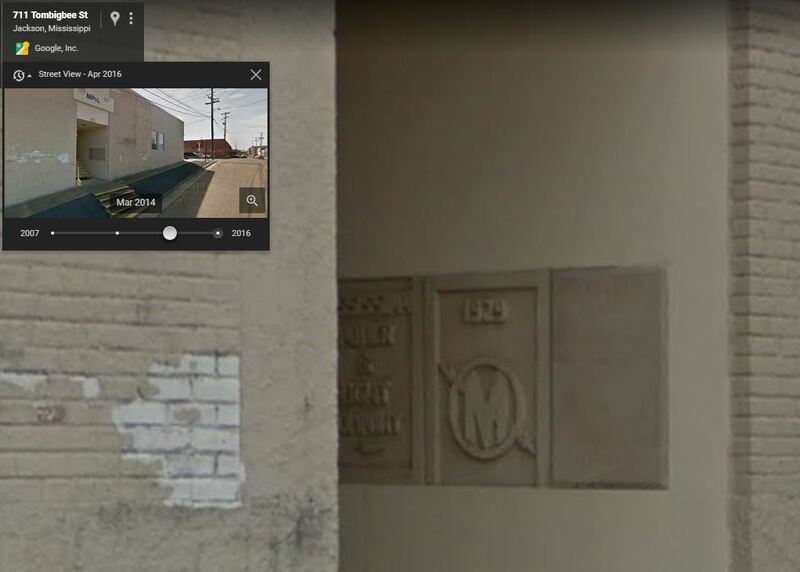 I agree that the plaque on the right is earlier vintage and that the plaques have probably been reset in this location. In the N.W. Overstreet Architectural Records at MSU are sheets 2-5 of plans for Mississippi Power & Light Company Warehouse & Car Barn, 1929.